Food safety experts agree: Raw eggs that haven’t been pasteurized or otherwise treated to kill bacteria should never be considered safe to consume. 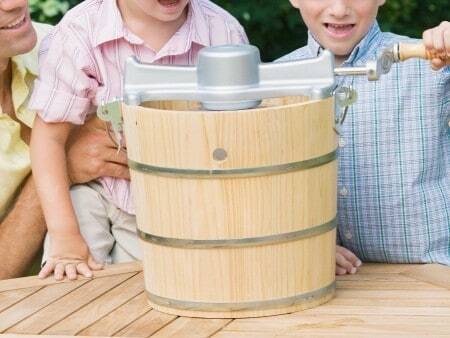 When we visit my in-laws during the summer, they always make homemade ice cream for the kids. When I object to the raw eggs they use in their recipe, they say they’ve never become sick so it’s not an issue. Is it safe to use raw eggs in homemade ice cream? It’s true that chances are small that the eggs your in-laws use will cause a problem: It’s estimated that only about 1 in 20,000 eggs are contaminated with Salmonella Enteritidis, the type of Salmonella that’s associated with eggs. Still, with the tens of billions of eggs produced in the U.S. that aren’t pasteurized, that leaves about 2.2 million that would be contaminated in any given year. Fortunately, the vast majority are cooked before being eaten. But the U.S. Food and Drug Administration estimates that 142,000 illnesses each year are caused by Salmonella-tainted eggs. Most people who get sick from Salmonella experience fever, diarrhea and abdominal cramps anywhere from 12 to 72 hours after consuming a contaminated item. The illness generally lasts four to seven days, but for those at highest risk — including infants, older people and those with a weakened immune system, such as pregnant women and anyone with a chronic illness, including diabetes — the illness can be serious, even life-threatening. Why take a chance? Cook the egg base, also known as a custard base. Combine the eggs and milk as called for in the recipe. You can add the sugar at this step, too, if you’d like. Cook the mixture gently, stirring constantly, until it reaches 160 degrees F. That temperature is high enough to kill any Salmonella bacteria that might be present. Use a food thermometer to be sure. Afterward, chill the mixture before adding the other ingredients and freezing the ice cream. Use an egg substitute instead of in-shell eggs. You might have to do some trial and error to determine the right amount. Use pasteurized in-shell eggs. Although they’re more expensive, they are becoming more widely available. These come in a normal egg carton and are clearly labeled as pasteurized. When it comes to adopting new food safety practices, it’s very common for people to resist unless they’ve experienced foodborne illness related to that particular food item. “We’ve always done it this way, and we’ve never had a problem” is a typical response. But when you’re serving other people, your first responsibility is for their health and well-being. Don’t let your relatives brush off your concerns, especially when your children are involved — and especially when there are perfectly reasonable alternatives available.